The tech sector has posted impressive gains. Year to date, the TSX Tech index has returned 24.40%, far exceeding the 2% gain of the TSX Composite Index. Over the past month, however, the tech sector has been consolidating. When a sector begins to show weakness, I immediately go to my watch lists. My growth watch list contains stocks that have solid fundamentals, strong historical trends, and double-digit expected growth rates. If these companies are so great, then why aren’t they in my portfolio? One reason — valuation. Thanks to the recent consolidation, two stocks have jumped to the top of my list: Open Text (TSX:OTEX)(NASDAQ:OTEX) and Constellation Software (TSX:CSU). Over the past month, Open Text has lost 2.1% and it’s now trading approximately 6% below its 52-week high. Although this may not seem like much of a dip, Open Text has been in a steady uptrend over the past number of years. Drops of 5% only occur a few times a year. As of today, the company is trading at a weighted average price-to-earnings (P/E) ratio of 14.7. This is well below the company’s historical P/E ratio of 17.5. The company is also trading at cheap forward valuations. Its forward P/E is 16.47 and it has a 1.23 P/E-to-growth (PEG) ratio. Both are well below industry averages. 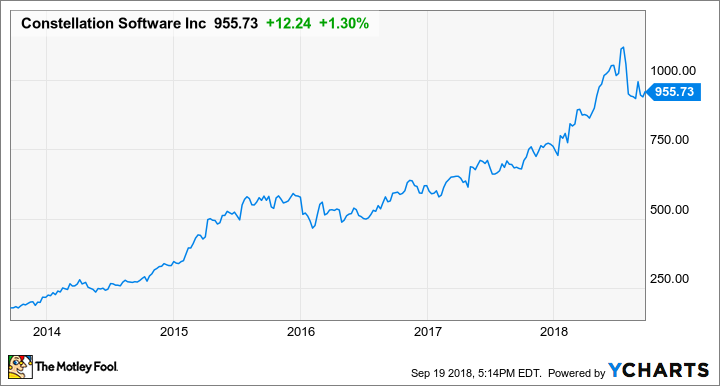 Using 2019 estimates, Open Text should be trading at $61.60 per share based on its historical P/E ratio. This implies 25% upside, in line with its recent performance. The company is also a Canadian Dividend Aristocrat with a six-year streak of double-digit dividend growth. Constellation Software has managed to post a 3% gain this past month. The company, however, has yet to fully recover from its post-earnings slide. On the first trading day post second-quarter earnings, the company lost almost 8%. As you can see, July’s slump is but a small blip on a beautiful chart. Constellation Software’s weighted average P/E is 28.2, which is still well above the company’s historical average of 17.2. That being said, its current share price is the cheapest it has been in the past six months. The company caught investors off guard when it did not hold a conference call post-earnings. Likewise, it has stopped providing quarterly guidance. Speculation has since run rampant. I have no doubt that this has pressured Constellation’s stock. Is there reason for concern? Management believes that these moves are in the best interest of shareholders. Time will tell, and, as such, third-quarter earnings will play an important part of the company’s narrative. In the meantime, it remains a company to watch. The Motley Fool owns shares of Open Text. Fool contributor Mat Litalien has no position in any of the companies listed. Constellation Software and Open Text are recommendations of Stock Advisor Canada.